First Nations' leaders say yesterday's apology by B.C. Premier Christy Clark for the hangings of six chiefs 150 years ago is as important as a recent Supreme Court of Canada victory. 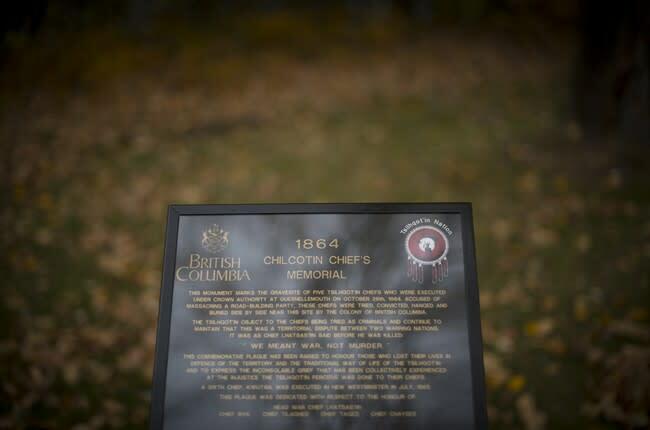 In 1864 five chiefs were called to what they thought were peace talks to end the Chilcotin War, but instead they were hanged. A sixth chief was hanged after trying to offer reparations. Yesterday, Premier Christy Clark stood in the Legislature in Victoria while Tsilhqot'in leaders sat behind her, listening to words they say finally sets things right. "We confirm without reservation that these six Tsilhqot'in chiefs are fully exonerated for any crime or wrongdoing," said Clark. Chief Roger William says yesterday's exoneration of the chiefs of any crime or wrongdoing was an emotional end to what he calls "unfinished business." He believes their sacrifice is the reason the Tsilhqot'in recently won a historic victory in the Supreme Court of Canada, which recognized their title over 1,700 square kilometres of land in central B.C. Chief Joe Alphonse also underlined the importance of the moral victory of the provincial apology. "We've gone through the Supreme Court of Canada We finally got recognition of title, but before we even get to that, there's some old business we had to take care of so to hear Christy Clark read that out, that's such a huge, huge day for our nation," said Alphonse. "Those warriors are the main reason that we were able as a nation to fight for 20, 25 years, which eventually became the June 26 aboriginal title win — the first of its kind in B.C., in Canada, in North America, in the world." William says his nation can now move forward with turning the Supreme Court of Canada ruling into real governance and authority over economic development, and enter a new relationship with senior governments. But the Tsilhquot'in chiefs are now calling on the federal government to make the same declaration as the province.